Lausanne gets ready for 4th World Para-Taekwondo Championships and 2013 Swiss Open. LAUSANNE, SWITZERLAND (June 7, 2013) – The Swiss city of Lausanne is ready for the upcoming 4th WTF World Para-Taekwondo Championships and the 2013 Swiss Open. The 4th World Para-Taekwondo Championships, which will take place at the Centre Sportif de Grand-Vennes in northern Lausanne on June 8, are expected to draw a total of 86 male and female athletes from 26 countries, according to the organizers. The 26 countries, which have already expressed their intention to send their athletes, are Argentina, Austria, Australia, defending Azerbaijan, Brazil, Canada, Croatia, Denmark, Finland, France, Great Britain, Greece, Guatemala, Iran, Iraq, Israel, Mongolia, Mexico, Nepal, New Zealand, Poland, Russia, Spain, Sweden, Turkey and Ukraine. A total of 53 athletes from 14 countries competed at the previous 3rd World Para-Taekwondo Championships in Santa Cruz, Aruba on Nov. 22, 2012. The comparable figures were 36 athletes from 16 countries for the inaugural World Para-Taekwondo Championships on June 10, 2009 in Baku, Azerbaijan, and 65 athletes from 21 countries for the second World Para-Taekwondo Championships in St. Petersburg, Russia on May 11, 2010. The one-day event will feature Olympic weight categories: -58kg, -68kg, -80kg and +80kg for male athletes, and -49kg, -57kg, -67kg and +67kg for female athletes. A total of 32 gold medals, 16 each for males and females, are at stake. Weight categories are modified as follows: amputation with both limbs above elbows (A5), amputation of one limb above the elbow (A6), amputation of both limbs below the elbows (A7), and amputation of one limb below the elbow (A8). Modified competition rules will apply to the championships. Attacks on the head are prohibited and the duration of contest will be three rounds of one minute with a one-minute break between rounds. A Daedo protector and scoring system (PSS) and an instant video replay system will be introduced. The competition of the World Para-Taekwondo Championships will be held between 2 p.m. and 5 p.m., with the final matches taking place shortly after the opening ceremony. The opening ceremony of both events will take place at the competition venue from 5 p.m. on June 8. The two-day 2013 Swiss Open, which will take place at the same venue, will be held in the morning of June 8 and the whole day of June 9. A total of 302 athletes from 53 countries are expected to participate in the annual Swiss Open. 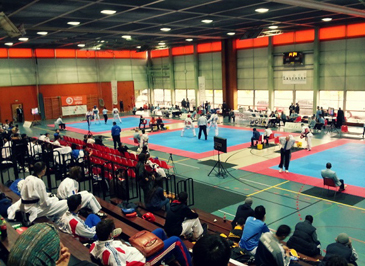 The inaugural Swiss Open, which was held on Nov. 10-11, 2012, drew 240 athletes from 45 countries. A total of 30 international referees will officiate at the two championships. There will be the WTF Council meeting at the headquarters of the International Olympic Committee in Lausanne from 2 p.m. to 6 p.m. on June 7, one day before the 4th World Para-Taekwondo Championships. The Council meeting will select the host countries for the 2013 WTF World Cup Taekwondo Team Championships, the 2013 WTF World Taekwondo Grand Prix, the 9th WTF World Taekwondo Poomsae Championships in 2014, the 1st WTF World Cadet Taekwondo Championships in 2014, the 2015 WTF World Taekwondo Championships and the 10th WTF World Taekwondo Poomsae Championships in 2015.